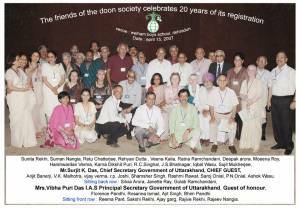 The Friends Of the Doon Society (FODS) is an organisation working actively over the last 34 years, primarily devoted to the protection and conservation of the environment, wildlife and greenery of the verdant Doon valley (250 kms north of New Delhi, India) and the areas around it. Its activities are numerous with a strong emphasis on preservation of the eco-fragile environs of the Doon valley, especially Rajaji National Park (RNP) along with the lesser Himalayan range above the valley. FODS was initially formed by five concerned citizens of Dehradun in the year 1983, mainly to stop the limestone quarrying on the hills of Mussoorie and bring to light the damage it was causing to the environment. The Friends Of The Doon Society was registered on 18th August 1986 under the Societies Registration Act 1860, with its five founding members, namely (late) Ranbir Bakshi – Chairman of the Council of the Cheshire Homes in India, (late) Gulab Ramchandani – retired headmaster of the Doon School, (late) Vijay Mathur – a distinguished officer of the Indian army; (late) Mady Martyn – wife of the Headmaster of Doon School, and Florence Pandhi-currently a member of India’s Supreme Court Monitoring Committee. A Memorandum of Association was formed shortly with about sixty likeminded citizens as members. Registration No: 116/1995 Under Societies Registration Act of India. Our current membership of about 88 is a committed one, made up of professionals from all walks of life – each one dedicated to the tenets of the society. The society’s membership is independent of government aid, is dedicated and single minded about the need for protection of our dwindling natural resources, and ever willing to put its hand to the plough when it comes to planning and organizing activities that draw the focus of the public to its environmental responsibilities. FODS encourages Schools to join its ranks, knowing that our future is dependent on the sensitivity and active cooperation of our children. The Managing Committee of FODS consists of ten members who are elected every two years. Each project is overseen by a Managing Committee member. We have one Office Manager who is responsible for administration and supervision of ongoing projects. Village Projects when undertaken, have two assistants from the village itself who co-ordinate with the manager. FODS present office is situated in a peaceful, green location, at Rajpur, a suburb of Dehradun, surrounded by the foothills of the Himalayas. The Society’s Registration Certificate no. is 116-95-96 and donations to the society come under the 80 G certification. The society received a citation from the state government of Uttarakhand for exemplary performance in conservation of nature and wildlife. Recognition by the Global Environment Fund for attending meetings and seminars. Recipient of USFWS grant from the Asian Elephant Fund. Selected by ‘Elephant Family Multi-Fund’ as 1 out of 5 organisations from South East Asia after an audit and scrutiny by Conservation Direct. The principal area of FODS’ operations is in the Doon valley, 250 kms. north of Delhi, with the Mussoorie range of the Himalayas in its north and the Shivalik hills in the south, the river Ganga in its east and the river Yamuna in the west. The towns of Dehradun and Mussoorie were developed during the days of the British Raj, and perhaps the most renowned person who lived and worked in these two towns was Sir John Everest, who was instrumental not only in establishing the height of Mount Everest, but also the survey of the Indian subcontinent. FODS © 2019. All rights reserved.